I have been actively selling online, using PayPal since 2001. Over the years, I have experienced all of the ups and downs of using PayPal. My account was first limited by PayPal in 2003. Even after completing all of the required steps as requested by PayPal, they refused to lift the limitation, locking in about $1,500 in that account for 180 days. Back then, I tried and failed miserably at creating other accounts that I could use for my eBay business. PayPal has a very smart system of tracking you, however, if you can beat this system you can be on your way to using PayPal again, with little to no worry. Since 2003 I have had a number of accounts suspended a number of times, sometimes I have been successful at lifting the limitation, other times I have not been as successful. To take full advantage of this information, please read thoroughly prior to implementing any of the techniques suggested here. It’s very important, that for your overall success of getting back on to PayPal, that you follow the guidelines here to prevent your account from being limited. Violating PayPal’s TOS in regards to acceptable websites, and transaction types. These are the major reasons why PayPal will limit an account. 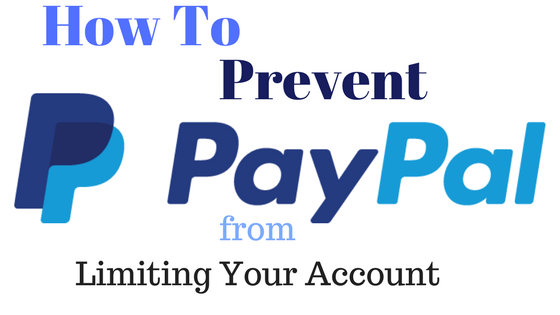 If you can avoid all of them you can be rest assured you will use your PayPal account without any problems. If you want to learn how to prevent getting suspended or banned on PayPal, you’re going to have first to understand a little bit about how it works. First of all, PayPal limits account with suspicious or “high-risk” activity to prevent losses. The way it does this is by robots that are trained to identify specific behaviour – specific triggers cause them to freeze up accounts. Now, here’s the thing – they use robots to monitor your accounts. Since there are millions of PayPal accounts and thousands of transactions happening on PayPal every second, it is very unrealistic for them to have a big room of human staff monitoring every little activity carried out on every PayPal account. So, they monitor your account with a robot. Listed below is the sequence of what happens most times that triggers PayPal to limit an account. The suspicious activity was done –> Robot picks up on the suspicious activity and triggers limitation –> PayPal asks for additional information –> PayPal human employee reviews information to reinstate your account or permanently limit it. But here’s the right thing about robots – they’re very predictable. If you can learn what triggers limitations, you can avoid them like landmines. So, without further delay, let’s start learning some of the types of behaviours that cause limitations. Before you attach a new stealth PayPal to your website, you should know that If you have had a PayPal attached to your website before, and it gets limited, PayPal then blacklists your domain name from ever using PayPal again. So if you try to attach a new stealth account directly to your site, you’ll get banned still. Luckily, there is a solution. If you use a third-party checkout tool that uses PayPal you’ll be able to accept PayPal without fear of being limited. Another thing that you can use is to host the checkout on a different domain name so that the PayPal doesn’t see it. I've seen some people manually invoice their customers using PayPal too. Learn how to access stealth accounts without getting limited. That means no proxies, no IP’s that change every 2 seconds (so no TOR or HMA). Step 1 – Know your basics! Use of proxies, HMA, TOR, or any of those “IP hiding software.” eBay and PayPal have blacklisted these IPs’. If you use them, you will get banned, simple as that. Not changing your user account between different PayPal or eBay accounts. The exception is if you use a VPS (remote computer) as the files are separated automatically then. Go to your control panel, create a separate user for your new PayPal or eBay account. Use your PayPal and eBay exclusively just on that user account. One of the most common ways to get an account suspended is by moving money too fast. Let me give you an illustration here. Let’s assume you received $200 into your PayPal account, then 5 minutes later you try sending part or all of the money to someone else or try to buy something with it or you try to withdraw the money. Boom, your account gets limited. In PayPal’s eyes, the reason why they limited you is that when you move money too fast, it looks suspicious, so they limit your account and stop you dead in the tracks. When you receive money in your PayPal account, let it sit in there for 2-3 days before you try spending it, withdrawing it, or doing anything with your money. The second most common way to get an account suspended is by taking in too much money at one time. Look at it from PayPal’s stand-point. If a guy that doesn’t have an established history of receiving large amounts of money suddenly starts getting hundreds of dollars at one time, it looks kinda suspicious. Don’t be the guy that receives too much money at one time, or you’ll get PayPal limiting you and asking you for personal details. Solution: So how much money is too much? On a newer account, start off by taking payments less than or around $100 and don’t let the total balance on the account get above $500. If the money gets near $500, wait a couple of days and withdraw it or send it to another account. Of course, when your stealth account gets older, you can start getting more substantial amounts of money, but if you want to be safe, that’s the general guideline you should follow. Now if you need to receive more money than that, just use multiple stealth accounts to break the payments up. Another potential outcome, if you take in money too fast, is that they will ask you for social security information to make sure you’re properly taxed. Now PayPal quotes that this number is something like 200 transactions of $20,000 a year, whichever comes first. However, if you come right out of the gate taking in a lot of money, they’ll ask you for social security much sooner. Best way to combat this is just to receive money through different accounts, so the funds are more dispersed. Let’s just say that you have $600 in your PayPal balance. If you try to go ahead and withdraw the whole $600, you’ll get limited. Always try to leave some money in PayPal, at least 10%. When you withdraw all your balance, it makes PayPal think that you’re robbing the bank and skipping town. That means it’s suspicious, so don’t do this. Solution: Always try to leave some money in PayPal (at least 10%). So for example, if you’re withdrawing $600, leave like 60-70 dollars in there, don’t withdraw everything. You’d be surprised how many people get limited by this sort of problem. When you try to send money and get this message: “Add funds to your PayPal before sending money” and yet there is money in your account. This happens when you try to move money too fast on a relatively new PayPal account. PayPal has this filter that prevents you from sending out money. If you have a relatively new account and get this message, your account is under a soft review. However, don’t freak out, because chances are, if you don’t do anything else that’s suspicious during this time, they’ll usually release the balance in a couple of days. What to do when you get such message: Don’t try to send money out over and over again. Just leave the balance for a week and come back to try to send it again. It could last up to 21 days, so try again here and there. Most of the time, it’s resolved after a couple of days. I have experience in opening and verifying PayPal accounts for residents of countries blacklisted by PayPal. If you need a duly verified PayPal account that you can use to send and receive money, you can use my services. Get the details of my services here: Easiest Method to Get A Verified PayPal Account Anywhere.